Back to sports this week for our captioning perspiration, er, um, inspiration. Must be the Olympic influence. So kick this pic around and let's see who can score a winning caption. And don't forget to rush over to The Screaming Me-Me, where hopefully Mad Mad Margo has gotten over her flu and has one of her funny pics to huddle over. Sure, Muffintop was in his fifteenth year of high school, but the team still needed him. No Jimmy, you're playing fullBACK. fullBACK! The 'Statue of Liberty' play is so much easier since they discovered they can hide the ball in Jeffrey's navel. 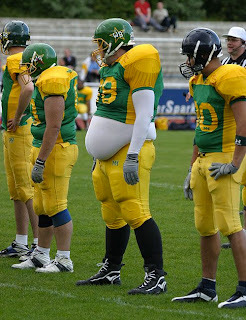 In Kentucky, pregnant women are allowed to play tackle. Why the "Try our human-roo sac" campaign went south. Clearly a case of dunlap disease, his belly done lapped over the top of his pants. Though her doctor advised against playing tackle in her last trimester, it was nonetheless a championship game and she had to do it for the team. "Farber, Farber, he's our man! If he can't eat it, NO ONE CAN!" Late in the game, the Spartans took a fifteen-yard penalty for eating the passer. Sometimes trying to relive the good ole days is not the best idea! Whaddya mean my uniform's too small? I got it on didn' I!?! Uh Buddy, why are you wearing one of our uniforms? You should be on the other team, you know, the team called "Beer Bellies or Bust"!? !